I was going to make my new wishlist for Zaful web shop but then I realized I want to do something different this time. Since I have never done any outfits for night time, I thought I'd be a great opportunity to share with you some pieces from Zaful that can be really elegant for night out! So do you like this outfit? I want to know which piece of this outfit is your favorite? 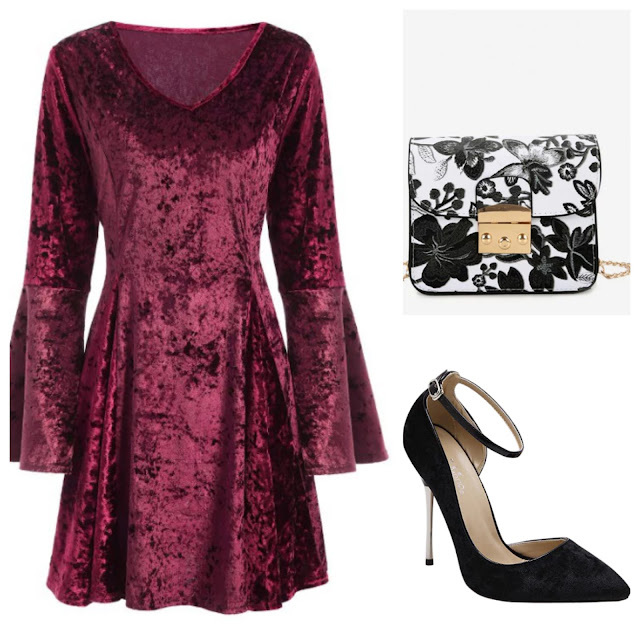 I'm absolutely in love with this velvet dress, the sleeves are so interesting and the color is really pretty! Please tell me in the comments down bellow, I love reading your comments! Thank you all so much for visiting and reading this post! I really hope you've liked it! Btw. thank you for 170k page views! My blog is growing so fast it all seems unrealistic! Odlična wishlista, najviše mi se sviđa torbica. Super stvarcice si izabrala. Cipele i torbica su prelepi. Predivna selekcija, draga Vildana, odlicne stvari, bas mi se dopadaju!